As the Indo-Pak tensions subside, INR stability has returned temporarily. The Dollar is strong overall, with EUR trading at 1.1330 and USDJPY closing in on 112. Brent is lower at 65.50 level and should support INR. This Friday’s non-farm payroll is a critical data point and any reasonable print above 160-170k level would be considered Dollar positive, given the surprisingly high jobs number last month. China deal hopes continue to linger on, as there were comments from some officials that both countries are in final stages of negotiation and that this tariff stalemate would not continue beyond this month. Trump-Xi meeting is slated for this month end, and there is a possibility of a formal agreement by that time. But, it would be interesting to watch how markets react to any deal on the trade war front, and if this would a case of “buy the rumour and sell the news” when the deal actually happens. 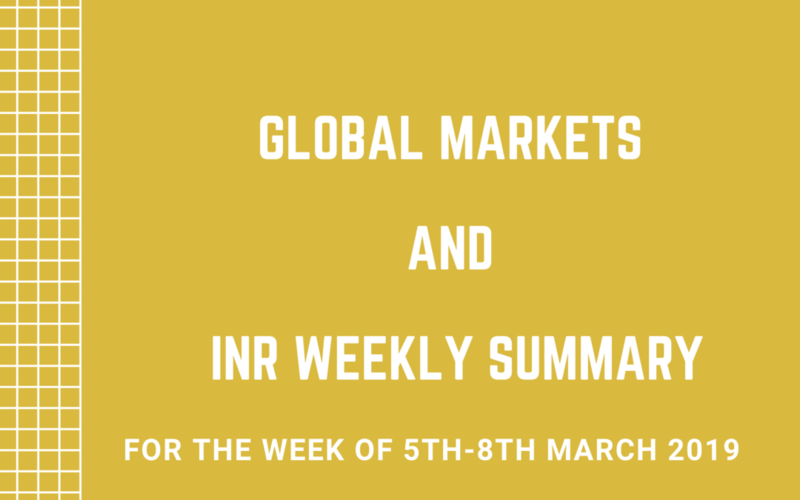 As we head into the election cycle, the risk to INR would start increasing, as historically, the Rupee tends to be uncertain before the elections and tends to settle down post the election if a stable government is in place. But the recent air strikes on the terror camp in Pakistan is likely to help BJP to a certain extent as the narrative shifts to a need for decisive leadership. On the macro-front, FOMC decision on the 20th is the next critical event, as markets would expect them to announce a formal date for stopping the balance sheet normalization program. The broad INR range continues to hold for now. Yesterday saw a sharp INR appreciation, which was the strongest single-day INR appreciation since November. Markets seem to have discounted the possibility that there would be no escalation in the Indo-Pak conflict, which led to other factors taking over. FII flows have picked up a bit, and the expectation of a positive NCLAT order on Arcelor bid for Essar also seems to have contributed to the selloff in USDINR. If the NCLAT provides a go ahead, one can expect INR 40k crore (6 billion) flow. Indian equity markets saw a broad rally, probably also on increasing hopes of a BJP win in elections, as national security becomes the primary campaign theme. The Dollar continues to be strong and EUR has fallen to 1.13 level, as ECB meeting kicks off. Tomorrow’s ECB decision is expected to be dovish. The market is looking for an announcement from ECB that they would restart the term loan program for commercial banks (TLTRO), to provide a boost to the sagging growth. If the ECB shies away from the TLTRO announcement, EUR can recover a bit from the losses of the past 2-3 days. USDJPY is hovering around 112.00. AUD is down to 0.7060 on dovish RBA policy. Crude is flattish at 65.30. INR has some momentum going for it now, on easing of tensions and on flow expectations. While the broad range is intact still, momentum might lead to a break of the range towards the downside. There seems to be a sudden shift towards INR strength, as markets are looking at the large inflows expected in the near term. In addition to the Arcelor flow (if they win the court battle), FII inflow has increased over the past couple of days, right after concerns of further escalation at the border dissipated. There seems to be some confidence coming back in the international investor community that the chance of a stable government post elections is high. Dollar was mildly weaker yesterday against EUR, GBP and JPY. EUR is trading at 1.1310 and USDJPY is trading at 111.65. AUD continues to be weak, while CAD has weakened on the back of central bank commentary. On the China-deal front, there are reports that Trump is pushing for a deal of some sorts, but markets remain a bit cautious due to lack of further news on the progress of the talks. DOW was down yesterday, but Indian markets are seeing a broad-based rally. Today’s ECB policy announcement and Draghi presser are critical for the short term EUR movement. Another important data point is the tomorrow’s US Jobs report. But for now, domestic issues seem to have taken precedence for INR move. With the global environment benign, there might be a period of comfort for INR in the next 1-2 months (before elections) as flow situation improves. Given the sentiment on inflows, oil might become secondary in determining the INR direction in the short term. With sheer momentum going for the Rupee, one cannot rule out the possibility of a sharp move towards 69.50 and below, especially if the Arcelor flow hits the market, but this move would be subject to the court battle currently taking place regarding Essar assets. Election-related jitters could start playing out in April as the market focus would shift to how many seats would BJP win. EUR crashed yesterday after ECB turned ultra-dovish in their stance. They announced a new TLTRO program ( targeted long term loans) for commercial banks to counter a sagging growth in the EU zone. Growth projections are slashed significantly, and ECB’s forward guidance that there would be no hike through the end of 2019 contributed to a EUR fall. EUR breached the critical support of 1.12 and is headed lower unless Dollar weakness comes back. All other currencies such as GBP, CAD and AUD were also mildly lower against USD. USDJPY is flat at 110.50. Today’s US jobs data, if reasonably strong, can further contribute to broad USD strength. Interestingly, given that Trump does not like a strong Dollar, this Dollar strength would not go well with him and we can expect him to try and talk down the Dollar soon. On the domestic front, today’s expected NCLT ruling on the Essar-Arcelor case is critical for the short term direction of the Rupee. A favourable NCLT order for Arcelor can push INR lower, as the possibility of the 6 billion flow increases, while an adverse order can lead to a move back above 70.50. As happened in 2016, there seems to be clear coordination between central banks in turning dovish as ECB, the Chinese PBOC and BOJ are all pumping money. Slowly, the global environment is turning positive from a liquidity perspective and this benefits Rupee as flows situation improves. For now, the momentum continues to be of INR appreciation (with the caveat being the Arcelor flow) and the overall range for the Rupee has shifted lower.